Here is an excellent use for a meaty leftover roast turkey carcass. 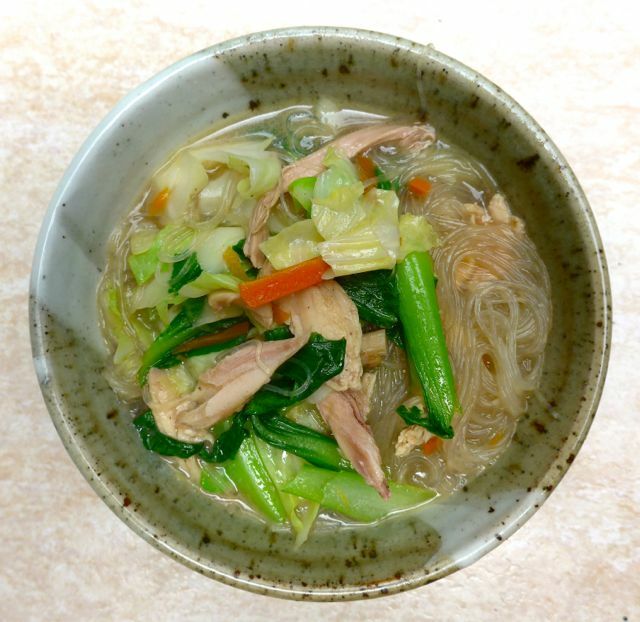 It’s a riff on a classic chicken sotanghon soup. I’ve decided I am not a huge fan of roast turkey unless it is brilliantly done and served still very warm, since it has a tendency to get a bit dry and frankly, tastes less appealing that other fowl or red meat. But I do love stuffing, and lots of the side dishes as well as the hubbub around say a Thanksgiving or other celebratory meal with turkey as the meal’s centerpiece… It’s always a bit of a challenge to come up with a recycled turkey recipe that pleases everyone in our household. If the volume of a recipe consumed is any indication, a ginormous pot of this soup was inhaled by 8 people in record time. Yup, it was surprisingly good. Not a big fan of turkey meat myself, but here is what I do with my turkey left overs. I save the larger chunks of meat for stuffing sandwiches. The carcass, I put in a large pot with water and simmer till the meat falls off the bones, throw in some chopped celery and carrot cubes then add cream of mushroom soup….. a hearty but slightly heavier than MM’s sotanghon soup that is more appropriate for the warmer clime. The best part after boiling off the carcass is picking off the bits of gristle and gnawing on the cartilage. Oh man!! 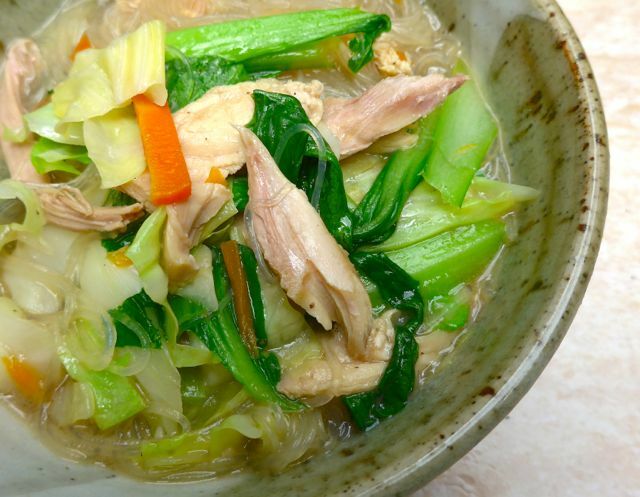 Best for soup season, now that it’s cold here…Yum! Getter Dragon,Lol!! I thought I’m the only”animal” who do that..I usually salt & peppered it together with some skin & broil it..yumm!! Fastest recycling – turkey fritters. Turkey + herbs + onions + shredded potatoes (or sweet potatoes) + flour + rice flour + S&P + leavening. Other combos according to imagination. Deep fry the damn things and look at them disappear! Even better with leftover cranberry sauce spiked with chillies and ginger! Natie, totally agree with you!….just love this weather for it is soup season…when my family gets tired of the usual turkey soup, I make it into congee with shredded falling off the bones meat and cooked century egg much like the shredded pork with century egg served in Chinese dim sum. Another one is like a Vietnamese rice noodle soup with different toppings such as the shredded turkey meat, sautéed oyster mushrooms, julienned carrots, sautéed napa cabbage, tofu puffs, turkey skin cracklings, etc. For baon, pulled turkey panini….shredded turkey meat smothered in Bull’s eye BBQ sauce, caramelized onions, Havarti cheese on thickly sliced calabrese and then placed on a panini press. Your bowl is beautiful. It reminds me of the chalice, ciborium etc by abueva used in ateneo’s chapel back when i was in college.